This Orbea Carpe 40 2018 bike is in great condition. However, it has previously been ridden for a number of miles, and as such there is some wear on the drivetrain. Cosmetically, the bike also has some damage with a scuff on the seat and marks on the forks. Comfortable and stylish, the Orbea Carpe 40 is a hybrid bike to enjoy daily. It makes for an excellent commuter or weekend canal cruiser. 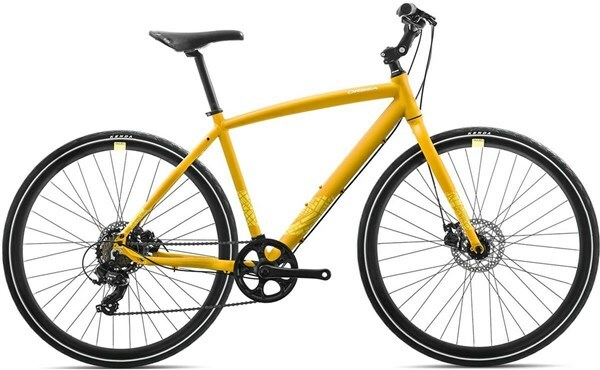 A comfortable and upright alloy frame gives a great position for city riding. It’s lightweight, and can take the bumps of everyday riding and commuting. It has quick release dropouts for easy maintenance, and the rack mounts and mudguards mounts allow you to make your Carpe more versatile for wet weather riding and transporting goods. The Shimano 1x7 speed drivetrain gives simplicity to changing gears, and reliable shifting. To slow you down and giving speed control at your fingertips are Shimano mechanical disc brakes, which work just as well in the wet as in the dry. For rolling duties, the Kenda 700x32c tyres give a balance between minimal resistance and urban comfort. The streets await, with the Orbea Carpe 40.